KawaiiPunk - Kawaii Mascot Blog: Cupid Confusion! Cute Mascot! Oh no! It seems the scatterbrained Cute Mascot has forgotten to put the name of her Valentine on the front of the envelope. What a disaster! She knows she was going to send the card to either Junior, Monster, or Tiny, but the question is… which one? 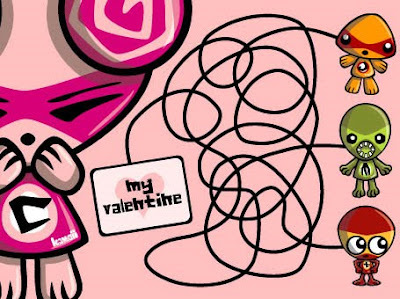 Can you get the Cute Mascot out of this tangle and work out who her Valentine is? The answer will be revealed in this month’s monthly round-up!